I have a bag of goodies for you today. Thanks to the help of wonderful volunteers, our WordPress plugin has been updated with translations for German, Spanish, Italian, Japanese, Polish, and Russian. It also includes updated translations for Portuguese and French. 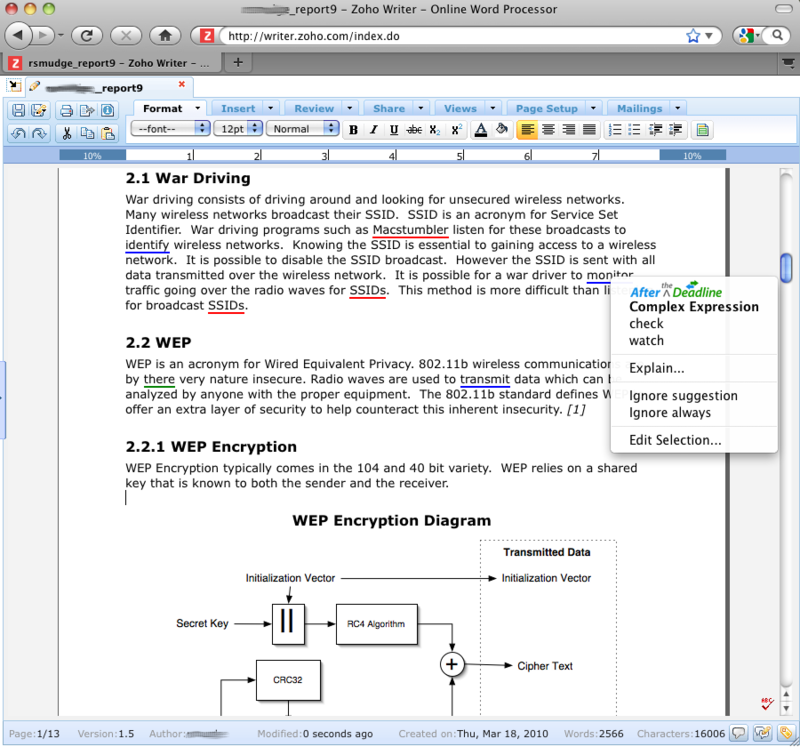 This update also fixes several bugs related to finding and highlighting errors. I recommend this update for all AtD users. You can get the latest from the WordPress plugin repository. If you use After the Deadline for Firefox, the 1.2 release is available on the early access page. The early access release exists because it takes time for the volunteer editors to review the release. An approval is necessary for it to show up as an automatic update. I like to think of it as a free code review from an experienced developer, just for participating in the Mozilla community. You can wait for the automatic update or get the early access release now. Don’t you want to be the first on your block to run the latest AtD for Firefox? This release fixes several bugs and improves the appearance of proofreading mode in WYSIWYG editors. 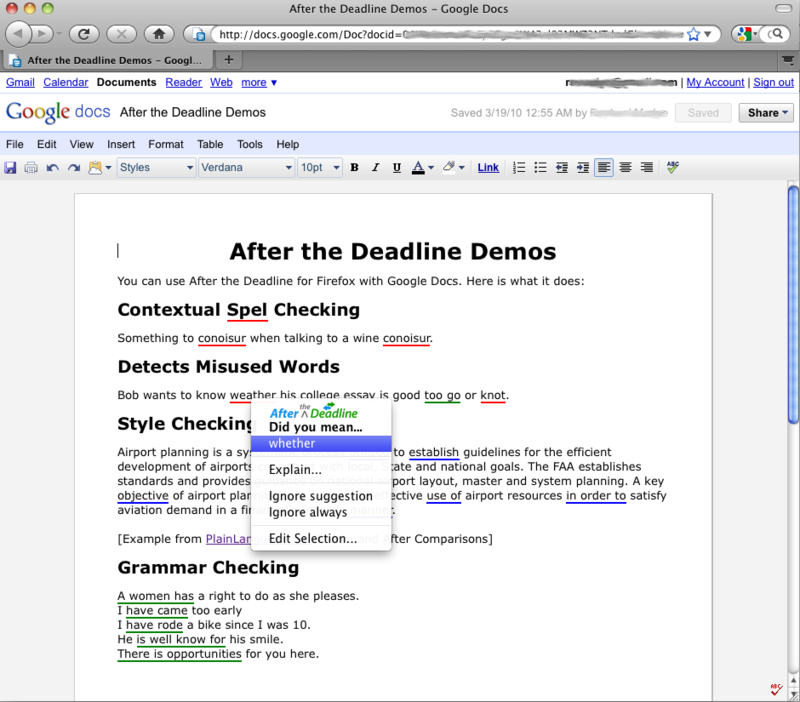 Take a look at the screenshots of Google Docs and Zoho Writer. Beautiful. Gaut.am just released AtD/bbPress 1.6. I think he knows more about my release schedule than I do. We’re always releasing updates at the same time. The latest bbPress plugin adds an auto-proofread option, the ability to select which errors you see, and an ignore always option. If you’re a developer using AtD, don’t worry–I haven’t left you out. Our TinyMCE plugin is up to date with the latest bug fixes. Also if you’re using the jQuery plugin, the cross-domain AJAX calls now support all the languages AtD supports. The AtD core library (the foundation of AtD’s front-end) has several bug fixes as well. Also, I don’t think I announced this yet, but last month M. Sepcot released an AtD API for Ruby. You can always find the latest AtD libraries on our Developer Resources page.